Ya Jagoff!!! | Not Even Close Parallel Pete! Home Parking Jagoffs Not Even Close Parallel Pete! Ya know ya failed basic geometry when you don’t know the difference between parallel parking and perpendicular parking. And, above all, you’re too stooooopid to take the lead from the other cars that are already perpendicular parking. Finally, let’s say they were supposed to parallel park… it’s STILL not a good effort. Lots of gap space between the car and the curb. 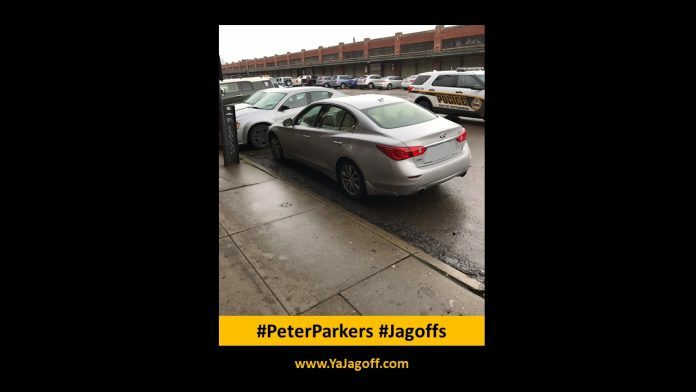 this takes parking in the Strip District to new levels of Jagoffery! OK..many things are confusing, I admit. Hell, I have to think of “vertical binds” to recall the difference between vertical and horizontal. Hey Parallel Pete …would love to see you get out of that space given how close you are to the driver-side door of that car in front of you! I guarantee that you are one of those drivers that, instead of backing up a full car length and then pulling out, you back up 6″ then pull forward 4,” backup 6,” then pull forward 4,” then back up another 6″ then pull forward 4″ then turn your front wheels to the right until they make that squealing noise to pull around the parked car in front of you! Why? Because you clearly don’t know how to drive OR park, YaJagoff! Thanks to the awesome bloggers at @PenniesPintsPgh for being Honorary Jagoff Catchers! 3 Step #PeterParkers and a Song! Sooooo…Hope Ya Have Your Skinny Jeans On!